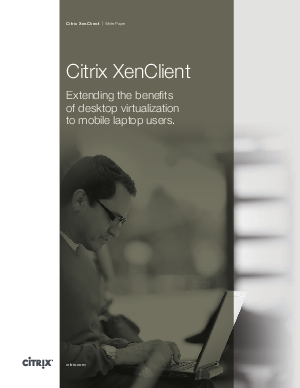 > Research Library > Citrix > Extending the benefits of desktop virtualization to mobile laptop users. Desktop virtualization is attractive to organizations of all types and sizes worldwide because of its many compelling benefits. Delivering virtual desktops significantly reduces operating costs while simultaneously strengthening data security and enhancing IT responsiveness to rapidly changing business conditions. One issue that arises, however, is the gap in coverage that exists for mobile laptop users, particularly those who need to continue working even when disconnected from the network. centralized delivery model also mean that users get the flexibility they want and IT gets the control, security and administrative efficiency it needs.